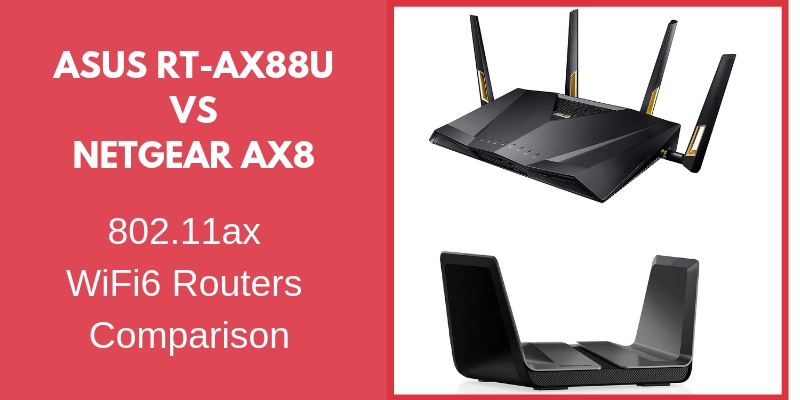 What do ASUS RT-AX88U and Netgear AX8 (RAX80) routers have in common? Both devices support the newest 802.11ax (WiFi 6) wireless standard which is the successor of the currently popular 802.11ac (WiFi 5). In this article we will compare and review the two wifi routers above which are “early adopters” of the newest WiFi standard and also give you some valuable information that you should know about 802.11ax (WiFi 6) in order to decide if buying such a device is worth it at the time being. Have in mind that both routers are fully-packed with specs and features, so the table below is just a small sample to get an idea of the main differences between them. These two wifi routers have a lot of similar specs and features. It looks like they mostly copied each other. However, they have some notable differences which can declare one of the models as the winner. Let’s first see quickly the main similarities. Both support the new WiFi 6 standard (802.11ax). Dual-band WiFi (2.4Ghz and 5Ghz) on both models. Same WiFi speed (1.2 Gbps on the 2.4Ghz band and 4.8 Gbps on the 5Ghz band for a total of 6Gbps of theoretical speed). Same Broadcom CPU processor (64-bit Quad Core at 1.8GHz speed). They support older WiFi standards such as 802.11ac, a/b/g/n etc. None of them supports the newest WPA3 security encryption standard. They both support Amazon Alexa. The ASUS has 8 Gigabit LAN ports compared to the Netgear device which has 5. The Netgear RAX80 model supports Link aggregation on the WAN side (by utilizing one LAN port together with the WAN port). The ASUS model does not support link aggregation on the WAN side (only on LAN side where you can aggregate two LAN ports). The ASUS device supports advanced parental controls and security protection with free lifetime AiProtection Pro from Trend Micro. The Netgear does not support these security features. The ASUS router has some dedicated mechanisms for online gaming to reduce ping and lag time (Adaptive QoS and wtfast). The first router in our article comes from a popular electronics manufacturer (ASUS) and boasts 6Gbps wireless speed (theoretical of course). This wireless speed comes from two frequency bands with 1.2 Gbps on the 2.4Ghz band and 4.8 Gbps on the 5Ghz band. Powered by a 64-bit Quad Core Broadcom processor (the same CPU powering the Netgear router in this article), has enough processing power to handle even the most demanding traffic conditions (video streaming, online gaming, virtual reality etc). As you can see from above, the RT-AX88U has plenty of ports / interfaces for your home network. The one Gigabit WAN port and 8 Gigabit LAN ports satisfy even the most demanding wired connections. Have in mind that the first two LAN ports (LAN1 and LAN2) support port aggregation (802.3ad) which means that you can combine these two interfaces to form a single 2Gbps interface on the LAN site. This of course requires to have a LAN ethernet switch which supports also port aggregation. Although you can aggregate two LAN ports, unfortunately you can’t do the same for the WAN, so you can have only 1Gbps on the WAN internet side. The two USB3.1 ports are very useful for connecting storage devices or printers to use over the network. The feature that stands above the rest here is its lifetime free security protection from Trend Micro (AiProtection Pro). AiProtection Pro uses Trend Micro’s cloud for web filtering, Intrusion Prevention, malicious website access prevention etc. The parental control capabilities of RT-AX88U include Deep Packet Inspection by Trend Micro to apply policies and protection to both Desktop Computers and Mobile devices as well. For gamers, the ASUS RT-AX88U utilizes adaptive QoS and its proprietary feature called wtfast. This feature finds the shortest path between your home gaming device (console, computer etc) and the closest game server in order to achieve lower ping and lag when playing online. Netgear usually manufactures quality networking devices and have raving fans. The AX8 (RAX80) is a member of the successful Nighthawk product series and possesses the same built quality as the other models in the series. However, we feel that compared to the ASUS router in this article, it lacks some important hardware and software characteristics and specs. The most notable of these include less gigabit LAN ports (5 compared to 8), and also lack of advanced security protection and parental controls that ASUS support. Although the Netgear router has fewer LAN ports compared to Asus (5 compared to 8), you have the ability to use one of the LAN ports together with the WAN port and aggregate the two for higher WAN bandwidth. Moreover you can combine two LAN ports for creating a 2GB interface on the Local network side. Let’s see an example: You can use one of the LAN ports together with the WAN port and connect both interfaces to a DOCSIS 3.1 cable modem that supports port aggregation (such as the Motorola MB8600 or the Arris SB8200). This means that you can have more than 1Gbps internet speed on the WAN side. Similar to RT-AX88U, the Netgear AX8 has also two USB 3.0 ports for connecting storage devices (flash drives or had disk) or printers. Regarding software features, the Netgear model lacks the advanced security protection offered by Asus and also does not support any dedicated online gaming enhancements like the Asus. All-in-all this model is inferior compared to its competitor with regards to software specs as well. Both ASUS RT-AX88U and NETGEAR Nighthawk AX8 are powerhouse devices. They are two models in the high-end of the wireless routers rank and are here to stay for many years in the future. They support the newest 802.11ax (WiFi 6) standard although its final specifications have not been published yet. We believe that both manufacturers have a very good history of updating and enhancing their devices so we are sure that all the necessary firmware updates will be implemented over time when 802.11ax will be getting finalized by the WiFi Alliance. Looking at our review above and the side-by-side comparison of both hardware and software features, the ASUS RT-AX88U is a better option in our opinion. Free lifetime subscription to Trend Micro (AiProtection Pro) for advanced parental controls and commercial grade network security. Special dedicated features for better online gaming (wtfast). The newest WiFi standard which will be finalized at the end of 2019 is 802.11ax. This is the successor of the current 802.11ac and uses the same frequency bands of 2.4Ghz and 5Ghz just like the AC standard. You must have in mind that the newest WiFi 6 will be backwards compatible with the older standards so even if you buy one of the new 802.11ax routers all of your home wireless clients will work fine. Faster wireless speeds and better performance. Better utilization of the frequency bands for better efficiency. It will perform better in environments with lots of connected devices such as smart homes with a lot of IoT and mobile devices, public hot-spots etc. Improvements to reduce power consumption of devices. Up-link direction on MU-MIMO for higher throughput. Support for WPA3 security encryption standard which is the replacement of the current WPA2. Overall, like everything new in technology, 802.11ax will be an advancement in the right direction. However, its still in early stages and support from manufacturers will expand a lot in 2019 (both from chipset manufacturers like Intel, Broadcom etc and also from wifi clients).